Venturing forth from our alcoves offices with determination in our hearts and, more importantly, delicious snacks and a significant amount of Pimms in our bags, the yearly OPIG punting trip is truly a spectacle to behold. Armed with multiple punts from the Cherwell Boathouse, our flotilla sails northwards past the Victoria Ams into lands unknown. Naturally, our competitive nature comes to play and punts are raced, and, inevitably, punts are crashed. Victors normally celebrate by plunging into the depths, the water on the good side of freezing (barely) this time of year. The return trip (downstream!) naturally requires refuelling at the Victoria. 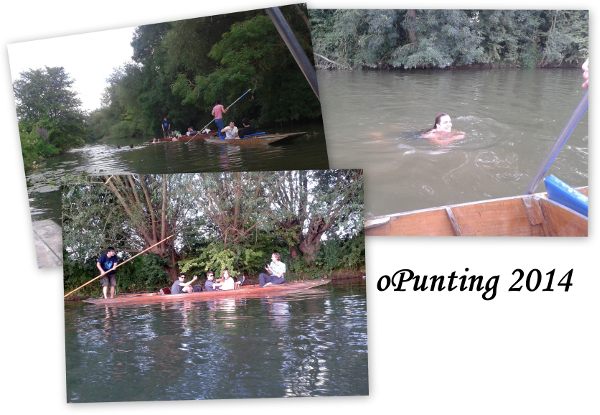 Aleks (our not-so-social sec) has written a report on our 2018 punting trip here! Website created by Alistair Martin and Eleanor Law. Maintained by Clare West and Matt Raybould.